The purpose of the Question of God Discussion Guide is to help facilitate group discussions after viewing the television programs. The illustrated guide is divided into nine sections, which include questions corresponding to the nine panel discussions in the series. Where appropriate, suggested "answers" are also provided to help ground discussion group participants in the ideas and beliefs of Freud and Lewis. it's easy to download from the Adobe Web site. 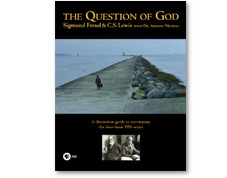 The Question of God Discussion Guide was produced by Walden Media and the WGBH Educational Foundation. The content was written and developed for Walden Media by Frederick S. Lee, M.D., Ph.D., of Brigham and Women's Hospital and Harvard Medical School, and Ryan Taliaferro, A.B., a doctoral candidate at Harvard Business School.